Baby birds are some of the cutest creatures on this earth!" So begins Rosalyn Daisey's latest adventure into fine carving. In this new book she leads the carver through the creating of the chicks of five birds: the Carolina Chickadee the Eastern Bluebird the Bobwhite Quail the Killdeer and the Wood Duckling. Each step in the process is illustrated with a clear color photograph and a concise explanation from the author about what the step involves and how to do it correctly. In addition there are reference drawings color palettes and photographs of study skins. As always Rosalyn share the anecdotes and insights of a wildlife lover and it is easy to see why her work seems to reflect a reverence for her subjects. 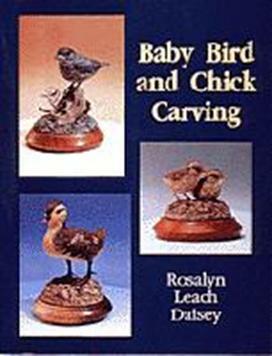 This is Rosalyn's fifth carving book.